The largest full-sized lever harp, the Delight weighs an amazing 11.2 pounds (5.4 kg). The harp delights with a deep, rich tone in the lower register, and features the unique design of a curved soundbox, making it an aesthetically-pleasing harp of all curves. This design also provides the advantages of rigidity, strength, and comfort. 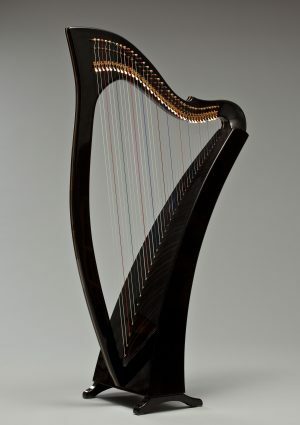 The ergonomically curved design allows the harp to be pulled straight into the player, providing extra room in the upper octave for the right hand, helping to maintain better playing technique.